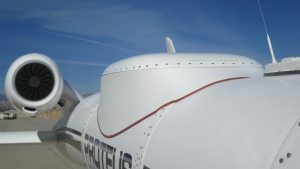 HAWTHORNE, Calif. – April 1, 2019 – ThinKom Solutions, Inc., today announced the successful completion of in-flight connectivity trials of its ThinAir® Ka2517 phased-array antenna mounted on the Proteus high-altitude long-endurance aircraft. The Proteus satellite data communication package was developed as a joint effort involving ThinKom, Inmarsat Government and Scaled Composites. The trials included initial tests in Chantilly, Virginia and the Mojave Air and Space Port, California culminating in a series of demo flights at White Sands Missile Range, New Mexico. “Inmarsat Government was pleased to support this important joint demonstration using the Inmarsat Global Xpress capability. The results of the trials proved, once again, that highly mobile government customers can rely on Global Xpress – a globally-available high-throughput, flexible and interoperable connectivity solution that provides coverage wherever and whenever required,” said Steve Gizinski, Chief Technology Officer, Inmarsat Government. ThinKom is exhibiting in Booth 4C42 at AIX 2019 in Hamburg April 2-4. The U.S. government has relied on and trusted Inmarsat satellite services since 1979. Inmarsat Government continues to deliver the world’s most advanced global, mobile satellite communication services to U.S. defense, intelligence, homeland security, public safety and civilian agencies, with highly reliable, secure and affordable connectivity. Built with government users in mind, Inmarsat Government provides resilient, flexible capabilities to augment government satellite resources, anytime, anywhere. Leveraging an industry-leading scalable multiband network infrastructure, Inmarsat Government offers a suite of managed network services and end-to-end communication solutions to support users on land, at sea and in the air, even in the world’s most remote regions. Headquartered in Reston, VA, Inmarsat Government is a wholly-owned subsidiary of Inmarsat plc. For more information, please visit www.inmarsatgov.com. Scaled Composites is an American aerospace company founded by Burt Rutan that is located at the Mojave Air and Space Port, Mojave, California. Founded to develop experimental aircraft, the company now focuses on designing and developing concept craft and prototype fabrication processes for aircraft and other vehicles. For more information about Scaled Composites, please visit www.scaled.com.